(with Murat Çokgezen) “Between Markets and Islamic Law: The Evolution of Islamic Credit Cards in Turkey.” Journal of Comparative Economics, 43 (2015): 862-83.
with Noah Blazer, “Crescent Moon Capitalism: Timur Kuran Weighs the Legacy of Islam’s Divergence from the West,” Today’s Zaman, June 28, 2012. (Ed.) Mahkeme Kayıtları Işığında 17. 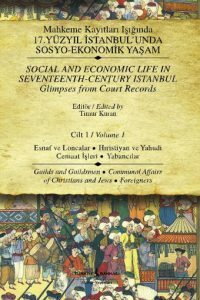 Yüzyıl İstanbul’unda Sosyo-Ekonomik Yaşam / Social and Economic Life in Seventeenth-Century Istanbul: Glimpses from Court Records, 10 vols. (Istanbul: İş Bankası Kültür Yayınları, 2010-13). 9–10. Credit Markets and Uses of Interest (529+497 pp.). “Internal Migration: The Unorganized Urban Sector and Income Distribution in Turkey, 1963-73,” in Ergun Özbudun and Aydın Ulusan (eds. ), The Political Economy of Income Distribution in Turkey (New York: Holmes and Meier, 1980): 349-378.